Criss Angel Celebrity Lookalike Look Alike Impersonator Tribute Artist. Photo Opts. Magic, Meet and Greet. As a boy, he performed as a clown, collaborating with Ringling Bros. Barnum & Bailey Circus and performing magic and comedy as a part of that collective on the Jerry Lewis Labor Day Telethon. 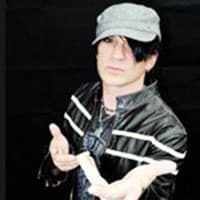 So, on top of being a dead ringer for Criss, Victor can do walkaround magic at any event as a Criss Angel Celebrity Lookalike Look Alike Impersonator Tribute Artist. He also shares Criss’ love of music and being a musician. Over the years he’s supported and worked with major acts such as Lady Gaga, Smashmouth, The Goo Goo Dolls and many more. Criss Angel celebrity lookalike look alike impersonator tribute artist. Practically every day, since moving to Las Vegas he has been mistaken for Criss Angel and takes multiple fan photos to please fans everywhere in Vegas and beyond. He even (for a moment) fooled Criss Angel’s show co-star Mateo Amieva! Additionally, while working on the Burt Wonderstone film starring Steve Carrell, David Copperfield also accidentally mistook him for Criss Angel. Criss Angel himself (after getting to know him) has been known to tease him in public yelling “It’s Criss Angel!” and running after him to cause a stir! He is now known to some around town as “Criss’ little brother.” He can do walkaround magic at any event.